It offers two big oscillators with the classic analog waveforms , from Grp, Plus Super Saw and Super Triangle; the great 12dB/Oct ; Grp State Variable Filter, one Ring Modulator (have you ever tried to ring modulate a 9-components Super Saw), One Noise Generator, one Amplifier, one Master Out section with a couple of gorgeous analog Vumeters. There are a couple of Envelope Generators, the Filter-dedicated one with Looping capabilities as on big Grp A4 Synth and a couple of LFOs/Modulation Routings. The on board Arpeggiator can be clocked by Internal Clock, ExternalAnalog Clock or MIDI Clock; easy and fun, it's a breeze to use. 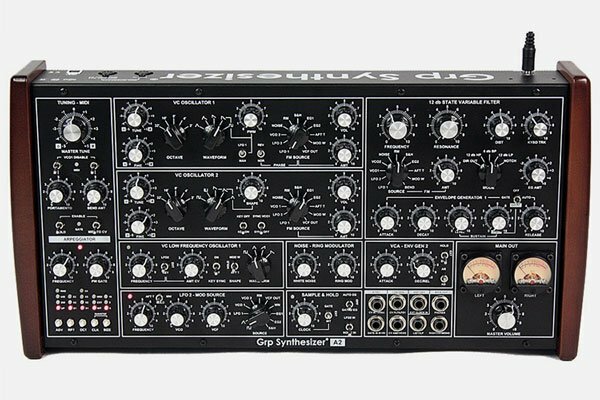 Grp A2 Analog Synthesizer is built like a tank. But is far more dangerous.